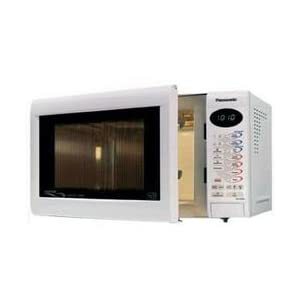 This is a powerful 1000w slimline combination microwave oven from popular electronics brand Panasonic. The Panasonic NNA554W has a great, stylish crisp white finish that looks at home in any kitchen. It has a generous 27 litre capacity whilst managing to be 20% slimmer than regular microwave ovens which is pretty impressive. The convection oven in the Panasonic NNA554W has a maximum temperature of 220 degrees and can go as low as 100 degrees which should be able to cook pretty much anything you can throw at it including jacket potatoes and roasting meat. As well as the oven and the microwave oven there is also a grill that heats up instant to brown and cook any type of food you would grill on a regular oven. So if you are looking for more than just a microwave this best selling microwave, grill and oven from Panasonic is for you!